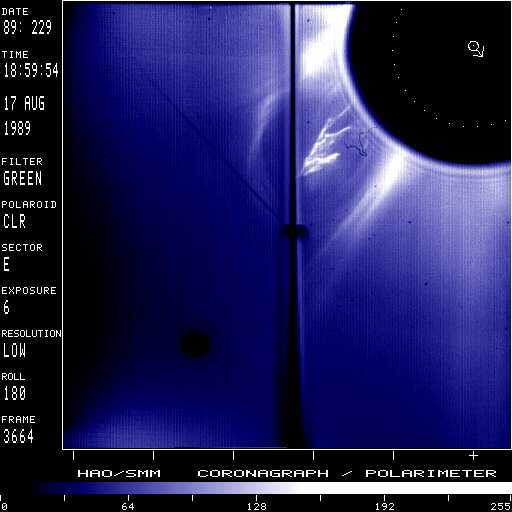 A fast moving loop with an embedded prominence was ejected over the west limb of the sun on August 17, 1989. Note that solar north (as indicated by the arrow in the center of the occulting disk) points toward the lower right; the dotted circle marks the solar photosphere. Structured loop/cavity and brighter, highly structured, complex, 'harpoon'-shaped, inner (prominence) core between streamer and fan. Fan to the south is disrupted. Big deflections.